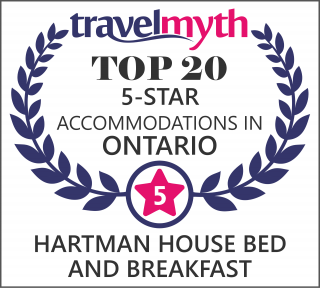 Whatever brings you to Sudbury, whether it’s romance, leisure, business, or for medical purposes, you’ll enjoy your stay at Hartman House. Each room is bright, clean and warm and comes with his and her robes. You have the choice of a romantic fire and cosy bed in the George room or a flat screen television and large queen size bed in the Grace room. Each suite is equipped with air conditioning for those hot summer nights. This wonderfully situated bed and breakfast is minutes away from the beautiful boardwalk along Lake Ramsey, Bell Park and Science North. Excellent transport links just outside the door, plenty of parking space, and lovely hosts will ensure your stay is a relaxing one. Laundry service and Airport pick up and drop off are available at an additional cost.